The central focus of our current Mid-Term Management Plan, which commenced in fiscal 2016, is to transform into a group capable of sustaining growth into the future with an eye on the domestic market after the Tokyo 2020 Olympic and Paralympic Games amid rapid changes in the external environment. Our vision is to evolve into a “theme park for the security, health, and wellbeing of customers.” More specifically, we aim to thoroughly enhance the appeal of each business while leveraging digital technologies, seeking out new business opportunities, and effecting changes through collaboration between Group businesses and by building ecosystems with external partners. Our ultimate aim is to create new business models that are a clean break from the past. As a holding company, Sompo Holdings will support the transformation of each business while guiding on digital and human resource strategies for the entire Group in the pursuit of realizing a “theme park for the security, health, and wellbeing of customers.” Moreover, Sompo is working to reform its business portfolio as a part of the transformation of the entire Group. Cash flows generated from steady growth in each business and excess capital freed up from the winding down of cross-shareholdings will be allocated to M&As in growth fields and investments in fields likely to show innovation, such as digital and cutting-edge technologies. As a result, Sompo aims to expand profits and improve capital efficiency further. 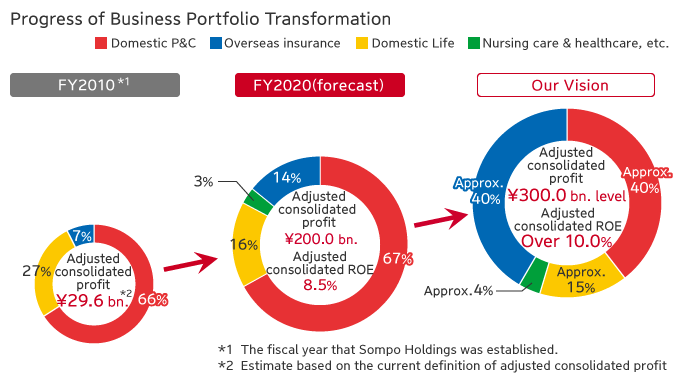 Through growth in both innovativeness (quality) and scale (quantity), Sompo intends to achieve as quickly as possible its numerical management targets for adjusted consolidated profit of over ¥300.0 billion and adjusted consolidated ROE of over 10.0%. Management will continue to execute Group strategies with the aim of becoming a unique and innovative group, unlike any other in the world, in promoting the security, health, and wellbeing of its customers. One of the Sompo Holdings Group’s strengths is the speed at which it takes on new challenges. In order to accelerate momentum in management, since the outset of the Mid-Term Management Plan, Sompo has pursued optimal Group governance by unleashing the centrifugal forces of each business through its Business Owner system and by leveraging functionality Group-wide through its Group Chief Officer system. Under these systems, during the first two fiscal years of the Mid-Term Management Plan, we put into place solid foundations for each business and defined the kind of transformation that each business should aspire to achieve. Reinforcing profitability and limiting volatility in profits in order to generate a steady stream of cash in this core Group business. we made every effort to create new value and build business models by utilizing digital technologies and partnering with innovative players. Acquisition of Sompo International (formerly Endurance Specialty Holdings Ltd.) in March 2017 led to a significant expansion in business scale while prompting a reorganization of our operations in developed countries. Intends to build out a global platform that also includes emerging countries with the aim of facilitating profit growth across the Group. Brisk business expansion centered on protection-type products led to growth in scale to a level that will consistently contribute to Group profits. As a health support enterprise, Sompo has launched a healthcare service brand with the aim of providing insurance with healthcare services (Insurhealth) not offered by other companies. Focused on improving profitability along with quality,realized turning nursing care business into profit. In addition to the nursing care business, we intend to help solve social issues through research and the provision of services centered on preventing deterioration in cognitive functions. As the third fiscal year of the Mid-Term Management Plan and its halfway point, fiscal 2018 is extremely important for Sompo. Not only must earnings begin to reflect the results of our accomplishments, the transformation of each business that began to show during the plan’s first two fiscal years must become more visible. In other words, we have to demonstrate solid progress that will move us forward into the second half (the realization phase) of the Mid-Term Management Plan. In the future, we aim to execute the Medium-Term Management Plan to attain a business scale (adjusted consolidated profit of \300.0 billion or more) and capital efficiency (adjusted consolidated ROE of 10.0% or more) on par with the top 10 global publicly listed insurance companies. 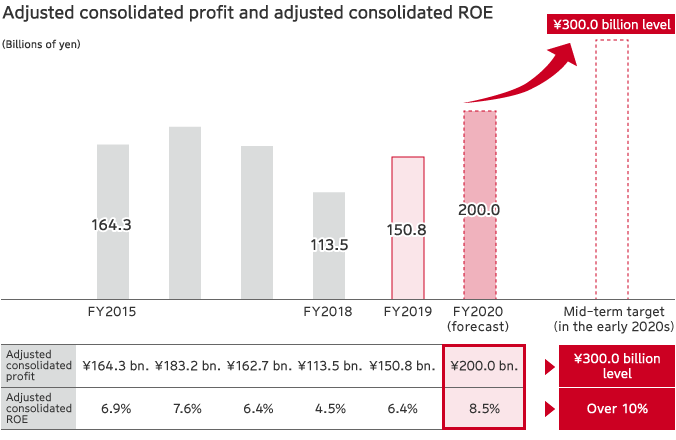 The adjusted full-year FY2018 consolidated profit is expected to be JPY 105 billion because claim payment for large scale natural disasters in Japan exceeded the initial estimate greatly. Excluding such impact from domestic natural disasters, the progress in the domestic P&C business is mostly on track of the plan and overseas insurance business, domestic life insurance business and nursing care & healthcare business are expected to increase income. Plan after FY2019 Scheduled to announce detail such as numerical management target around May 2019. For details regarding ROE,please refer to the link below.